This preserve can be made on the stove, but I prefer doing it in the oven. The edges of the quince get slightly charred which give them an attractive appearance and adds to the flavor. It can be served with game meat, pork, foie gras, duck…in fact, it is wonderful as an accompaniment with any red meat. It can also be served as a dessert with a dollop of crème fraîche or ice cream. I enjoy it slightly heated up. It goes well with cheese and as a friend Fanta, suggested, wonderful with a cured Manchego cheese. I don’t peel the quince, nor do I take out the seeds. They are loaded with natural pectin and I like the appearance with the seeds left in. 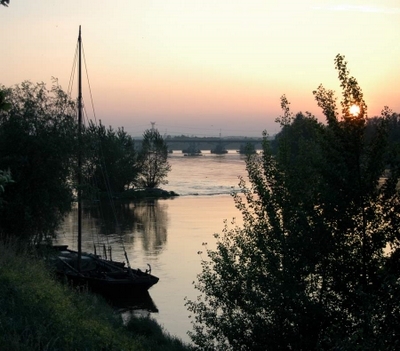 It also suits our rustic lifestyle, where the rythm of the vineyards and the untamed flow of the Loire and our love of the countryside colour the food we put on our table. If you want your quince to have a nice red colour, cut the slices already the previous evening, put in your pan and cover and add the rest of the ingredients the next day. Cut the quince, unpeeled into slices about 8 mm thick. Place the slices in a large oven pan. Sprinkle with the lemon juice and the zest. Add the star anis, cinnamon sticks and cloves. Pour over the sugar and water. Tuck in the rosemary branches. 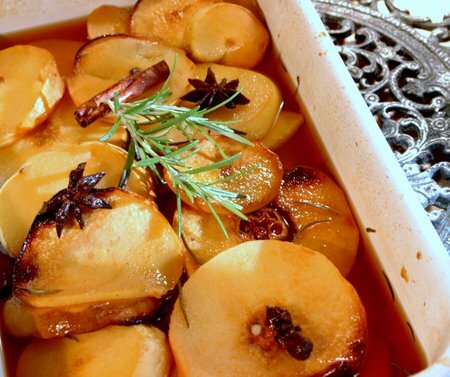 Bake in the oven for about 45 minutes or until the quince is soft. Remove from the oven and layer in hot, dry, sterilized bottles. Decorate with some rosemary and a star anis. Fill with the syrup and close the jars tight. Store in a dark, cool spot. This is an entry for WHB, hosted this week by Susan from The well seasoned cook. See Kalyn’s kitchen for more information on WHB. What a lovely photo of the quince preserve in the jars! I haven’t even tasted quince, and I keep wanting to try it. These look so yummy! I’ll have to see if I can even find quinces here. You always make things seem so easy and effortless! 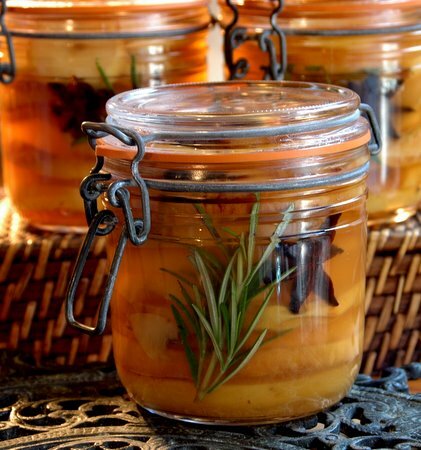 Not only fragrant but artistic, pressed in jars with rosemary and star anise. Thank you, Ronell, for this beautiful entry to WHB! So lovely! I didn’t cook much qith quince except poaching them. Your recipe is an inspiration! Your preserve looks wonderful and brings back memories of my mothers canning regime in late autumn. This is going on my list of homemade holiday gifts. So beautiful. I appeciate all your suggestions for pairing too. Those jars are so pretty! And your recipe sounds great. Ooh yes, with foie gras, perfect! Oh, how I love quince. This looks delicious! This looks amazing Ronell. You never cease to impress with techniques.. I had no idea how to control the hue, for example. Life is indeed a learning curve! I love your Food Photographs, they look really professional (AND mouthwatering). We have a surfeit of quince this year (the harvest varies from year to year) and I am going to try your recipe. However, I understand that star anise (badiane) has been a forbidden ingredient here in France since 2001 as it can cause neurological poisoning in babies. I wondered what subsitute you might recommend?